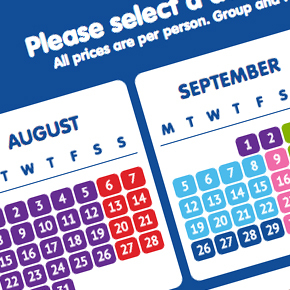 Planning your visit to Splashdown Quaywest couldn't be simpler - find out everything you need to know below! "The counter staff in the cafe were extremely helpful, especially with 44 boys coming through with food and drink. The food was of excellent quality and was served really quickly." We recommend that you book your trip online. Our online booking process is easy and will gurantee your booking in minutes. 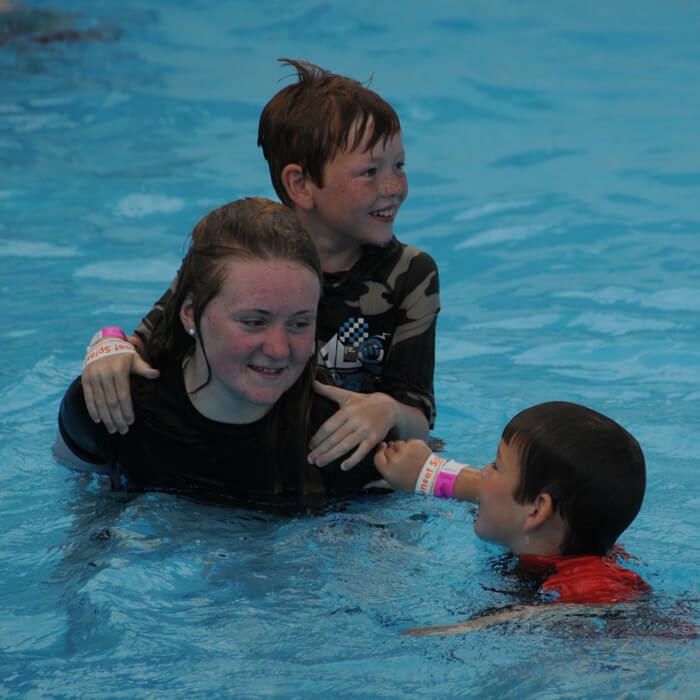 If you have a question that we haven't covered in our Group Hub, call us on 01803 555550 or email groups@splashdownquaywest.co.uk. How can we pay for a group visit? Your balance can be settled on the day by cash, cheque or debit/credit card. Invoicing can also be arranged in advance. How many teachers/leaders can attend? Schools can bring as many teachers as they need. 1 Group Leader will be admitted FREE for every 20 full-paying admissions. 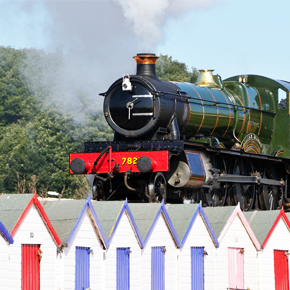 If your group includes children under the age of 9, then our standard 'Admissions Policy' will apply to your booking. What are the medical provisions on-site with qualified staff? We have a fully equipped First Aid room on-site and fully qualified staff. Please report any accidents to a lifeguard or and of our refreshment hut team immediately. Do any of the rides have flashing lights? No rides have flashing lights although some have some black holes. This information can be found in the park maps and on the safety signage at the entrance to the rides. Are all the rides inspected on a daily basis? All rides undergo daily flume checks in accordance with the manufacturers’ guidance. Rides also undergo a comprehensive winter check to ensure they are safe for the following season. Do all members of the group need to swim? Ideally yes, we strongly recommend that visitors using the flumes have an adequate swimming ability but you can still have fun and be safe if you feel that you are confident in the water. We have a variety of flumes with water depths ranging from 0.5m - 2m. We strongly recommend that weak swimmers do not ride Infinity as it has a 2m deep exit tank and make sure that you check the water depth at exit of any other slide before you ride. Black Thunder, Colorado Coaster, Baron’s Revenge all have deeper water exits and Mississippi Drifter is just over 1m deep throughout. All other slides empty in to shallow catch trays and are more suited to those who are less confident. Red River Roller is a good flume to start with. However, only you can decide how confident you are in your swimming ability in relation to the slide information provided, if in any doubt please speak to a member of the team. Can we arrive by coach or minibus? Unfortunatley we do not have any on-site coach parking. 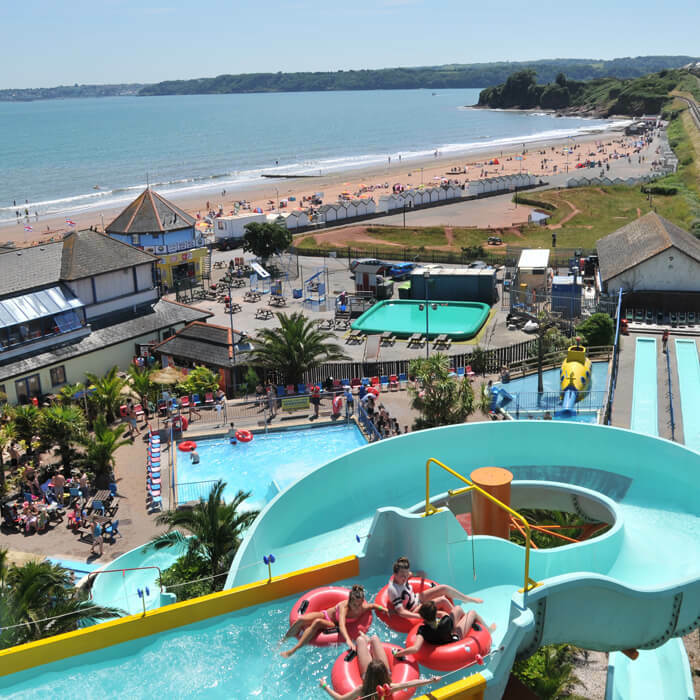 However, there is coach parking parking available nearby at Torbay Leisure Centre (situated adjacent to the waterpark). Coach Operators are welcome to drop guests off at the waterpark entrance on arrival before moving their vehicle. 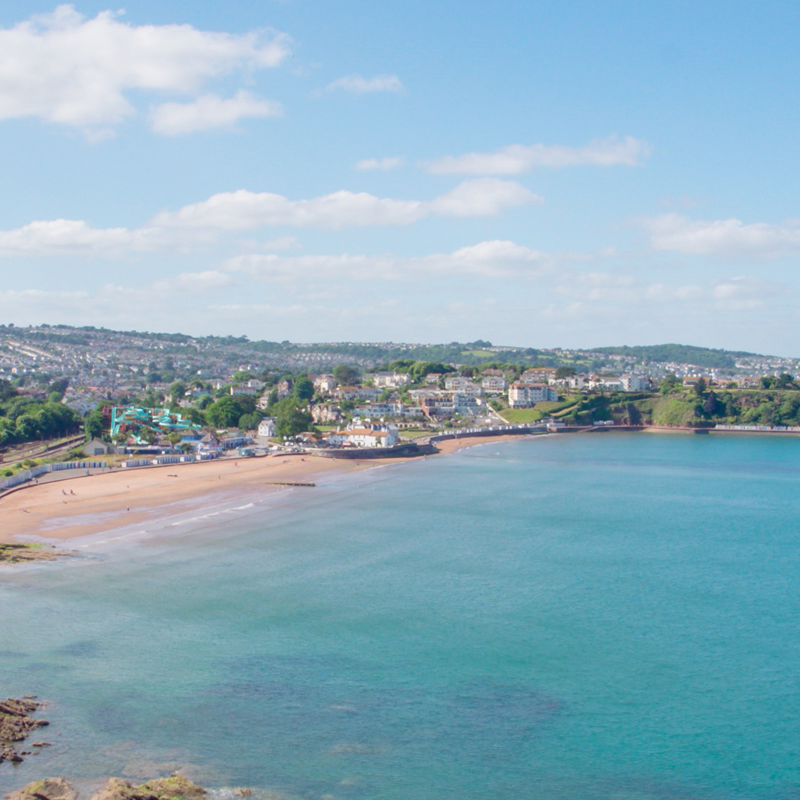 Please note vehicular access to Goodrington seafront is restricted from May to September. Is there a lunch room for schools to hire? There are no lunch rooms available but there are several seating areas around the park which may be suitable but we do not reserve, incuding our cafe and terrace. A range of sandwiches, hot dogs, chips, pasties and sausage rolls and serve Lavazza coffee and plenty of chilled drinks in our café. All food and drink consumed at Splashdown must be purchased on the premises. You will be asked to put your own food and drink away. What is viewed as acceptable swimwear? Cut off jeans and trousers, baggy shorts beyond knee length and transparent/inappropriate costumes are not permitted and we ask that you do not wear swimwear with zips or buttons as these may damage the flumes. Please be aware that bikini tops can be dislodged. We do offer a free wetsuit hire which requires a £10 refundable deposit. We prefer that visitors do not wear t-shirts as it can slow them up on the flumes. However, in certain circumstances discretion by the Duty Manager may be given, and should visitors ask about wearing a T-Shirt when entering, they will be given a disclaimer to sign. If a member of your group has specific dress requirements for religious reasons - speak to a Duty Manager. Please be advised white and luminous coloured swimwear does have a tendancy to go transparent, management will ask those they feel to be dressed innapropriately to get changed. We also cannot guarentee the fastness of the colour of your swimwear, although we use normal pool chemicals it may affect the colour. 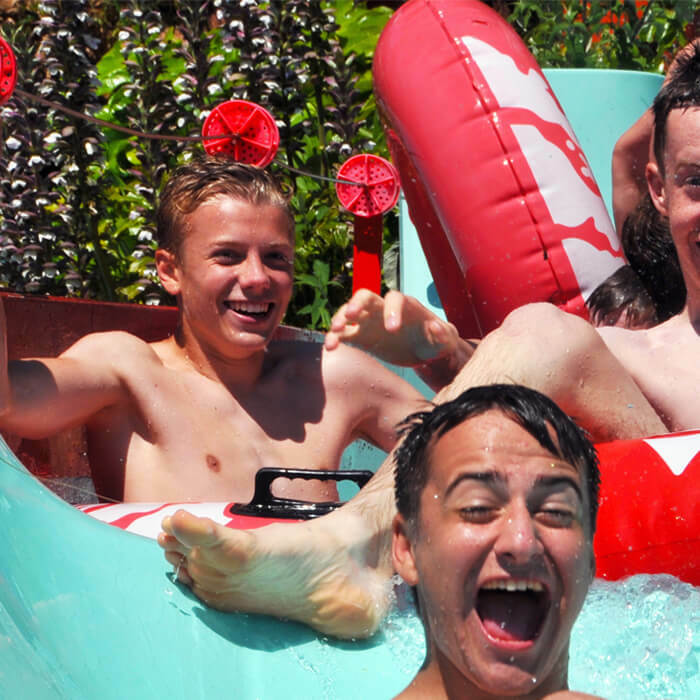 On arrival, Group Leaders should enter the waterpark through the door marked 'Groups & Internet tickets' and register with our Reception Team. We politely ask that your group wait outside whilst to ensure an efficient entry process. We offer a unisex changing village with individual private cubicles. We do also have a selection of larger family changing cubicles, some with changing tables for babies. Do you have lockers/how much are they? Yes, there are sufficient lockers in our changing rooms. These are operated with a non refundable 20 pence piece coin. Most of the park is uncovered and therefore in direct sunlight, however there is some areas of grass under trees throughout the park which provides some shade. Unfortunately we don’t allow visitors to wear glasses on the flumes as they can cause damage if sliders collide and can be easily lost. Prescription goggles are allowed if a disclaimer has been signed. Can group members wear piercings/jewellery in the waterpark? No, both must be removed before entering the waterpark. We recommend that your group leave jewellery and any loose piercings at home. Can group members use swim aids in the waterpark? While we suggest you don’t wear goggles, as it can worsen impact injuries, should a visitor ask about wearing goggles when entering, they will be given a disclaimer to sign. A child may wear armbands if they are not as confident in the water. Where is your Emergency Meeting Point? In case of an evacuation our Emergency Meeting Point is at the basketball court to the right of the kiosks and adjacent to the beach. Please report any item lost on the day to our Reception Team, or following your visit contact them on 01803 555550 or email info@splashdownquaywest.co.uk. 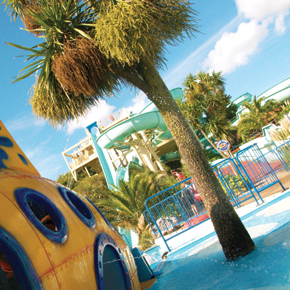 We hope that you may find the following documents of assistance when planning your group visit to Splashdown Quaywest. Tumble on tyres and twist through the tubes; check out our 8 adrenalin-pumping slides below; each with a varying degree of difficulty. Do you have any questions about the area before making your trip? Click here to find out more about where's near to eat, play and stay?